There are general principles within the Hoodoo tradition that act as guidelines for how to practice the tradition which often vary. For example, candles are generally marked with one's intention in some way. This is done by either carving words in the wax or placing a written petition underneath it. In addition, they are often dressed with condition oils as well. However there really is no standard ritual structure for framing one's spells. Unlike other forms of magic, such as Wicca or Ceremonial Magick, Hoodoo does not require the calling of the elements, casting of circles, or drawing triangles inside which spirits are summoned to appear. However, that is not to say that most practitioners haven't developed their own rituals around which they frame their spells. I know one practitioner that always bathes and dresses in all-white clothing before any spell or ritual working. Another practitioner I know spends a few moments in quite prayer or meditation before beginning her spells. Again, another practitioner simply grabs what he needs from his supplies and starts the process with little preparation. In my personal practices I have developed the following ritual around which I frame my spells and workings. First, I gather all my supplies and materials that I will need to work my spell and arrange them neatly on my altar. This will usually include a small dish of fresh, cool water that will act as an offering to the spirits I with whom I will work. I then take a few moments to "go through the motions", that is, I think about what I will say, what I will do and when I will say it or do it. When I am ready to perform my spell, I light two large white pillar-candles at either side of my altar. 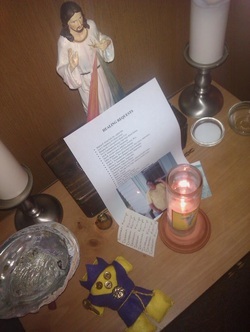 As you can see from the photo above, Jesus is the focal point of my main working altar, therefore all of my prayers are directed towards him or in his name. I usually begin by with the Adoration of the Lord of the Universe because it is a prayer that really speaks to me. "Holy are thou, Lord of the Universe! Holy are thou, which nature hath not formed! Holy are thou, vast and mighty one! Lord of Light, and Darkness!" This is followed by crossing myself a modified version of the Kabbalistic Cross. To do this I simply touch my forhead and say: Thine; followed by touching my solar plexus saying is the kindom; then my right shoulder saying and the power; then my left shoulder saying: and the glory. Finally I clasps my hands in front of my as in prayer saying: Forever and ever. Amen. Since my ancestry is part Jewish, I do this as a way of honoring my own ancestors as well as acknowledging that all power comes from God. "Spirit of Love, in thy name do I do this work of love that I may love and be loved by (name). I ask that you be here with me now and work through me to accomplish this task. In Jesus' name. Amen." Continuing with the previous example, let's say that I am doing a candle-spell for love. The next thing I would do is write out my petition or name-paper and then smoke it in the incense. Then I would anoint the four-corners and center with an appropriate condition oil and fold it towards me three times and put it aside. "With God's blessings, may (N) think of me as I think of him, desire me as I desire him, love me as I love him. In Jesus' name. Amen." Next, the candle would be lit and I would spend several moments in prayer. Typically I will pray a selection from the bible such as one of the Psalms. For example, I might pray Psalm 52 for reversing evil or Psalm 91 for protection. If I have no particular Psalm in mind, I would use Psalm 23. As in the case of our love spell, I would likely pray a selection from the Songs of Solomon. Again, this would be followed by the modified Kabbalistic Cross. Finally I leave the altar space and let the candle do its work. My altar is in a place in which I can keep an eye on my candles as I am doing other things (watching tv, sitting at the computer, etc..) Depending on the time of day or night I am burning my candles, I may go back to the altar and move the candle to a safe place (usually the kitchen sink or inside the stove) where it will continue to burn without causing a fire hazard. This usually only occurs when I began my ritual in the evening and the candle is still burning when I am ready for bed. The following day any ritual remains are examined for signs of the success or failure of the work before being ritually disposed. Incense ashed are cleaned up and removed and the candle holder is cleaned. This is how I frame my spells, my suggestion to you is to experiment and find something that works for you. You will know what works for you and what does not because it will feel right, the words and movements will speak to your spirit and your ritual will flow with ease.